Pilaf is a very old dish that is usually made of rice and some meat. It came to my country from the East, and still is one of the most popular dishes in the Middle East of Central Asia. Each country has national characteristics and many recipes for cooking it, but its distinguishing feature is the combination of two parts: the so-called ‘zirvak’ in the Uzbek cuisine or ‘gara’ in the Azerbaijani cuisine and the cereal part. I want to show, in my view, a rather unusual recipe, which we often cook. First of all, wash and dry the chicken and wash rice until the water is clear. Next, clean and wash the carrots. With the help of a juice squeezer make juice from 2 kg of carrots. The rest of carrots cut into strips. Clean and cut the onion into half rings. Next warm cauldron and fry chicken in vegetable oil. Then put the onion and carrots to it and fry until the onion begins to dub. Fill in the carrot juice, so that it covers the meat and vegetables and stew over low heat for about 30 minutes. In the end add the cumin and salt. Before you salt, try the liquid. Carrot juice excretes its salts and you can easily put too much salt into the pilaf. Once the zirvak ready, spread the rice on top evenly and increase the flame. Pour the remaining carrot juice. As soon as the rice gets almost ready, and all the moisture evaporates, collect rice into a hill, close with a tight lid, reduce the heat to minimum and leave for 20 minutes. 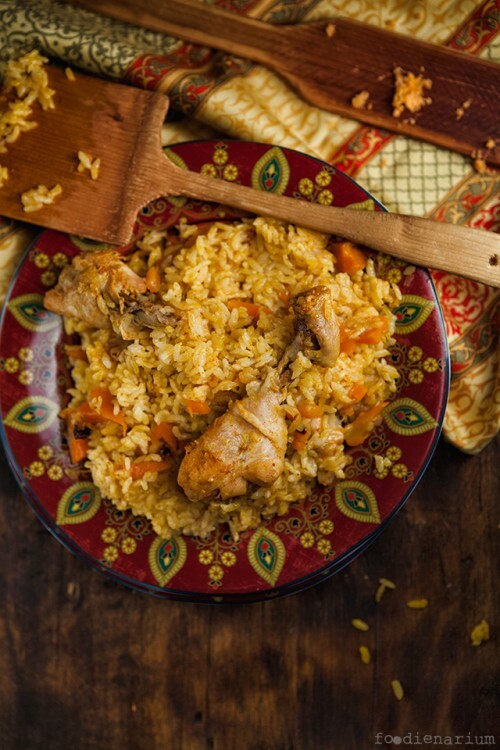 The result is a pilaf with rice and chicken of a bright golden color and a very interesting taste.